Forbidden goodies Scottie Mom bought the evil C-A-T-S! 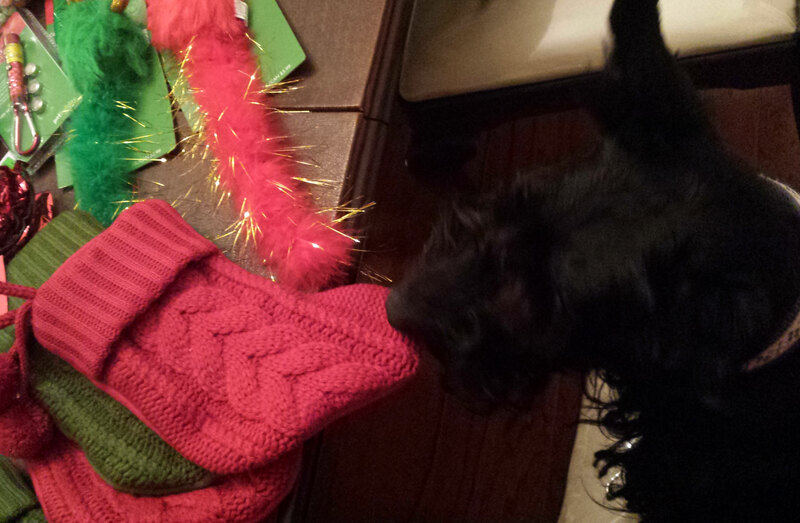 I decided to steal stocking in protest: one red one, one green one. But 'tis the season after all and so, I present these stockings to my kitty cousins with love. Happy holidays! Everybody deserves a little holiday cheer, even Mr. K's arch enemy: the evil C-A-T-S. Believe it or not, there are a lot of C-A-T-S in the family - just not in The Scottie House. Mr. K forbids it. It took a little convincing, but once he was on board with the idea, six small stockings were stuffed with C-A-T toys and delivered safely to his kitty cousins over the holidays. (He couldn't bring himself to personally deliver them, however...that was going too far.) Mr. K even stuffed a stocking for his doggie cousin Miss Circe. You might remember her from last year's birthday pawty. He knew she would appreciate a new toy and some yummy treats for Christmas! Heather and Mr. K's unlikely gifting didn't stop there. You see, there are also a number of horses and goats in the family - again, just not in The Scottie House. 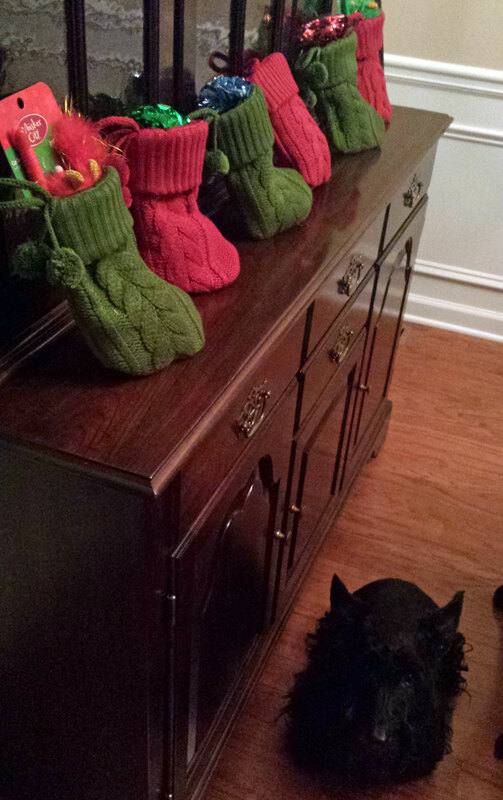 Alas, the Scotties helped put together a stocking full of carrots for these cousins. Ironically, Mr. K never tried to go after these strange, foreign-looking orange treats like he first did when he ran off with the C-A-T treat- and toy-filled stockings. I suppose fresh veggies aren't so appealing to the spoiled Scottie boy who prefers homemade blueberry doggie muffins made from scratch! As a result, Heather and Mr. K's horse and goat cousins got to keep all the carrot treats to themselves. And, much to Heather and Mr. K's surprise, the C-A-T cousins even banded together with all their other cousins to return the favor with a contribution to a Scottie rescue group in Heather and Mr. K's honor. It was a Merry Christmas of unlikely gift giving indeed! 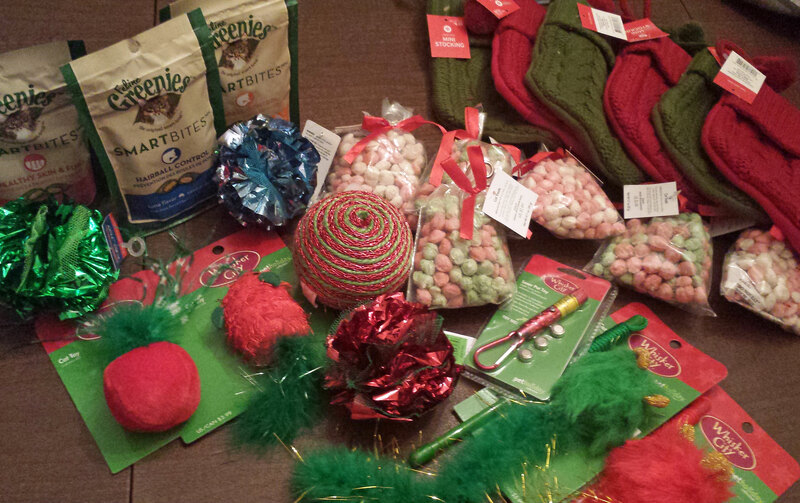 WOW Mr.K worked his tail off for Christmas, sure does have a lot of relatives, CATS,OMD he really went overboard! I don't mind cats at all. I was cooped up with cats before being rescued. You never turn on a fellow prisoner. Oh my your family is definitely a mixed up batch of all species. I love goats and horses ~ cats not so much. Oh such great treats! Brown dawgs would eat any treat, including carrots...lol.